The American Bar Association said President Bush's use of "signing statements," which allow him to sign a bill into law but not enforce certain provisions, disregards the rule of law and the separation of powers. Legal experts discuss the implications. RAY SUAREZ: The president's veto of a stem-cell research bill last week was the first of his presidency. But more often than other presidents, George W. Bush has claimed the constitutional authority to ignore, reject, or interpret bills after signing them into law. He's done so by issuing "signing statements" with many of the bills he's signed. Last December, when President Bush signed a bill outlawing the torture of military-held detainees, the attached signing statement left open his prerogative to ignore that restriction. 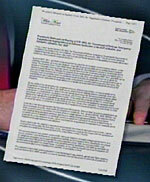 The president wrote, "The executive branch shall construe the act in a matter consistent with the constitutional authority of the president as commander in chief, which will assist in achieving the shared objective of the Congress and the president of protecting the American people from further terrorist attacks." An American Bar Association task force says the president has issued more than 800 challenges to legislation through signing statements. The ABA task force released a report charging the president's use of signing statements undermines the rule of law and the separation of powers. With us to explain is Bruce Fein, former associate deputy attorney general during the Reagan administration. He was a member of the ABA's task force. Also with us, Christopher Yoo, professor of law at Vanderbilt University. He testified recently before the Senate Judiciary Committee on this issue. And, Professor Yoo, let me start with you. What is a signing statement? And does it have the same force of law as the very bill that it's issued in tandem with? CHRISTOPHER YOO, Professor of Law, Vanderbilt University: From my perspective as a scholar who's studied the history of signing statements and the co-author of a forthcoming book on the history of presidential power, signing statements are a very old phenomenon that goes back to the days of James Monroe, Andrew Jackson, the earliest days of the republic. A signing statement is a statement penned by the Justice Department or the White House counsel's office, signed by the president, and issued when a statute is signed into law, which is the last step of making a statute become law. Does it have the authority of law? The answer is: It depends. I think that in many ways this issue is much overblown. Many parts of a signing statement are completely uncontroversial, many that congratulate supporters or thanks people for their support or explains what the likely impact of the bill is going to be. Where it gets hard is when a statute is unclear. Everyone agrees that when a statute is completely clear, there is no room for interpretation and everyone, the president, the courts, common citizens alike are under an obligation to follow the law. The problem is the statutes are often not as clear as we would like. Congress's attitude is to leave explanation of what a statute means up to the courts and to determine if a statute might or might not be unconstitutional. They are inclined to leave that to the courts, as well. The problem is, before the courts get it, the executive branch, the president has to confront those issues first, and they often have to take a position on the constitutionality on a statute or what a statute means. These are not questions of interpreting ambiguous statutes; it's a question of the president unilaterally declaring that provision he has just signed into law is unconstitutional and that he won't enforce it. RAY SUAREZ: Bruce Fein, you were on the task force that looked at this for the American Bar Association. In your view, does a presidential signing statement have the same force as the law that it accompanies? BRUCE FEIN, Former Associate Deputy Attorney General: Well, he intends it to be that way. And I disagree with the professor that the statutes that the president claims he will not enforce under his constitutional interpretation are ambiguous. The detainee treatment act, which you mentioned, was categorical: There shall be no torture, period, by any branch of the administration in interrogating or otherwise treating illegal combatants or those detainees held in the war. There is another statute that we addressed concerning the use of military in Colombia in combat situations with narco-terrorists, and the language of the statute was very clear: It shall not be done. And the president issued a staining statement saying, "I will interpret this as being advisory only." So these are not questions of interpreting ambiguous statutes; it's a question of the president unilaterally declaring that provision he has just signed into law is unconstitutional and that he won't enforce it. The Constitution envisioned the president use his veto power if he thought the Congress was overstepping its bounds, and then Congress could override the veto or Congress could delete the offending provision, but that was what the Constitution envisioned. Indeed, King James II was overthrown in Great Britain because he exerted what he called the suspending or dispensing power, where he would refuse to enforce laws enacted by parliament without his consent. And it was that history that caused the founding fathers to write into the Constitution an obligation of the president to faithfully execute the laws. Now, that doesn't mean that the president has to defend a law in court that he thinks is unconstitutional. There have been repeated occasions where the president tells the Congress that, "I will not defend this law because I think it's unconstitutional." For example, President Carter did that with regard to restriction on using money to implement his pardon of Vietnam War deserters and draft evaders, so that the president isn't obligated to compromise his own view of the constitutionality in court. But surely the president, in the constitutional scheme, must veto a bill if he thinks it's unconstitutional, not sign it and then say, "I won't enforce provisions," and end up then having a law that Congress did not enact. Because we shouldn't casually say that people like Congress and the president are doing unconstitutional acts. RAY SUAREZ: Professor, is Bruce Fein right? Does the Congress leave very few options, veto or pass? CHRISTOPHER YOO: I don't think so. I mean, that's never been the accepted understanding that applies to the courts and to the executive branch. There are a couple of situations that can happen. If a statute is susceptible to two interpretations, one of which would be constitutional and one of which would be unconstitutional, we generally expect courts and anyone sworn to uphold the Constitution to try to interpret the statute in a way that renders it constitutional. Why? Because we shouldn't casually say that people like Congress and the president are doing unconstitutional acts. And, in fact, this is a much more common situation than would you typically think. In fact, statutes are often ambiguous. They could be applied in ways that could comport with the Constitution and be applied in ways that don't comport with the Constitution. RAY SUAREZ: Well, Professor, when you talk about using interpretation in the application of a law, isn't that different from what Bruce Fein just suggested, that is issuing a letter at the very time that you're signing it, saying, "We don't think that this has any binding ability on us, as the executive branch?" You're declaring right from the get-go that you don't believe that some of the portions of the law actually apply to you. Our very first president, George Washington, who confronted bills that you might call omnibus appropriation riders, said, "I have to veto a bill or sign it in total." "I have to veto a bill or sign it"
CHRISTOPHER YOO: The answer is that occasionally happens. In many of the -- I don't mean -- I'm not a member of this administration and don't mean to speak to the specific vetoes of this administration. The best example I know of happened during the Civil War, when the Congress was attempting to determine to Presidents Lincoln and Andrew Johnson who the president of the Army would be. And they actually passed a statute that said to the president: You cannot fire General Ulysses S. Grant. Now, we know that the president is the commander in chief. And if that means anything, any of us who remember the tension between Truman and MacArthur, how important it is to have a commander in chief of the Armed Forces or the general of the Army to be someone that the president has confidence in. What the president then said is: I understand that Congress has passed a statute that says I cannot fire the general of the Army, but the Constitution gives the president the power of commander in chief. And he says: I understand that's advisory, but there are times when a statute clearly violates one of the president's powers. And Bruce gives another example, when President Carter wanted to pardon Vietnam draft resistors, and the Congress attempted to stop them. The pardon power is a clear power given to the president. And I think President Carter was completely entitled to exercise the pardon power as the Constitution gave him the power to do that. RAY SUAREZ: Bruce Fein, for its part, this administration has said that now, more often than previously in our history, bills come as parts of massive omnibus pieces of legislation which have many, many provisions. And rather than veto it, we're just going to voice our objection to this one part of a large, multi-facetted bill, rather than fight it all the way back down through the Senate and the House again. BRUCE FEIN: Ray, this is not unique. Our very first president, George Washington, who confronted bills that you might call omnibus appropriation riders, said, "I have to veto a bill or sign it in total." Now, President George Washington was president also of the Constitutional Convention, and that practice basically maintained for hundreds of years. William Howard Taft, another president, maintained the same. Now, the fact is, when presidents have vetoed bills that they've thought were unconstitutional, once and perhaps twice in 217 years has Congress ever overridden the veto. So the fact is, when the president finds a bill that he thinks is unconstitutional in part, he vetoes it, Congress will remove the offending provision if it's really urgent and important. And that is what history honors. There's nothing in the Constitution that says, "Oh, the president can cut corners if he wants to, if he thinks the bill is too long." Congress is equally accountable to the American people. And if they hold up a bill because they're frivolously pursuing an unconstitutional provision, they will pay for it. And that's why Congress has not attempted to override presidentially-motivated vetoes, where the Constitution has been at issue. RAY SUAREZ: Professor, very quick response? CHRISTOPHER YOO: Bruce's position is inconsistent with the position taken by the Clinton administration, by the Bush administration, and the last several administrations of both parties. Again, a good example comes from World War II. FDR faced a statute that said Congress -- passed a statute that said the president had to approve every naval expenditure before it was made. The president said: I understand that the Congress has a role in limiting the way these expenditures are made, but as commander in chief, there's a certain latitude that comes here. And if you look at the unbroken history for the last 200 years or certainly since World War II, in a strong sense that has never been the understanding that any of the last administrations of both parties have felt. Congress trying to get back power? RAY SUAREZ: I have to ask you before we go, the ABA has released its report. Are the Senate and House trying to wrest back some of this power? Is there legislation about signing statements in the offing? BRUCE FEIN: Well, I'm working right now with Senator Specter's office. I submitted a draft bill today. And I think he's eager to move forward. The House side is more dormant. And the one thing I would say, that long-standing practice does not establish constitutionality. The legislative veto had a history longer than that enumerated, with regard to presidential signing statements by the professor, and the Supreme Court held all of them unconstitutional in 1983. RAY SUAREZ: Gentlemen, thank you very much. Presidential historians weigh in on Mr. Bush's use of executive powers in the U.S. war on terrorism. Analysts discuss now Supreme Court Samuel Alito's views on the president's use of signing statements. The McCain "Torture Amendment" was one of the key pieces of legislation President Bush signed with caveats.